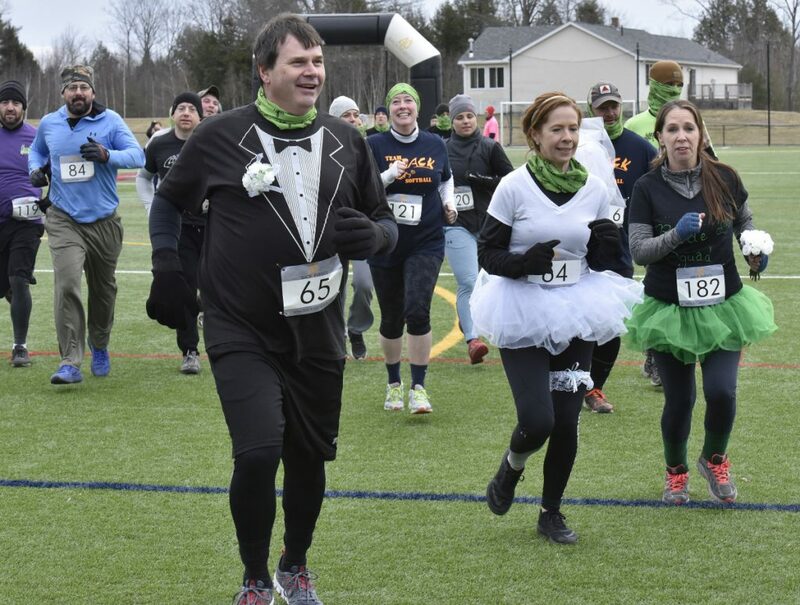 In an unusual ceremony, two runners tie the knot after completing the annual Dirty Dog Mud Race at Thomas College while decked out in wedding gear. WATERVILLE — The sky above Thomas College was overcast Sunday, with a bitter wind biting at any exposed skin it could find. It probably wasn’t the best day for a 5K race through the mud. But for Bill Jackson and Jennifer Denis, it was the perfect day for a wedding. The couple, who live in Randolph, were participating in their second running of Thomas College’s annual Dirty Dog Mud Race, an event that benefits the college’s recreation program and puts runners through the mud and obstacle courses through several heats. Last year, Jackson and Denis began running for exercise. After a quick ceremony in which they were declared husband and wife, the two said it just seemed like a good idea. Covered in mud from the course, Denis ran in a white veil, and Jackson ran in a tuxedo T-shirt. They were flagged by Denis’s sister who ran with them as bridesmaid and held a bouquet. The party took off right around 9 a.m., and by 10 a.m. they were a married couple. Each put a ring on their partner’s muddy finger. “This was supposed to be low key,” Denis said after a crowd of spectators had gathered to watch their brief ceremony. After crossing the finish line together, the muddy couple were greeted by family and friends before taking their vows. After the ceremony was over, Jackson and Denis were given a small cake, with crumbled cookies and gummy worms on top. “It’s pretty good,” Jackson said after the two gave each other bites of the cake. 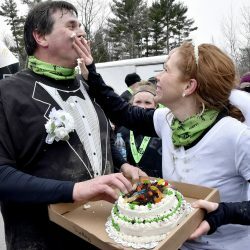 Jennifer Denis rubs wedding cake in the face of husband Bill Jackson after the Randolph couple were married at the finish line. The newly married couple will have a few days before heading out on their honeymoon. However, their destination might not be that much warmer than the mud run they will be leaving behind — Jackson said they’ll be heading out on Wednesday for Ireland. Sunday’s race was the fourth annual event, according to MacKenzie Riley, the school’s assistant director of media relations. The event has grown tremendously since its creation, with 300 people coming out for the first event, to about 700 this year. Registration prices varied, and all proceeds went toward the Recreation Department for more student opportunities for outdoor activities. She said the Central Maine Motors Auto Group is the big sponsor of the event, and always sends a team to run the course. In addition to being a 5K run, the event is also an obstacle course, with just about 15 challenges like monkey bars to climb, walls to scale, tires to flip and logs to jump over. Runners clad in bright neon shirts and spandex — and some brave souls in only shorts and T-shirts — ran the course in various increments, with announcers quipping jokes over the megaphone in between heats. Bill Jackson and Jennifer Denis, both of Randolph, wore wedding outfits as they heave tires during the race. “The mud’s warm, that’s what I heard,” one announcer joked as runners prepared to take off, later adding that runners should make sure to exfoliate with the mud to open up their pores. To combat the cold, runners were allowed to take hot showers at the college’s Alfond Center once they were done. Even that proved to be fertile ground for a joke, though. Participants and spectators, mostly wrapped in heavy coats with hats and gloves, were treated to Shipwreck coffee and woodfire pizza to keep warm as well. The race also featured a mini obstacle course open to children up to age 10.